What a new German movie can teach America about confronting its history with domestic radicals. In 1985, Stefan Aust--one of West Germany's most prominent journalists and for many years editor of Der Spiegel, the country's most popular news magazine--published a book about the Red Army Faction called Der Baader-Meinhof Komplex, which went on to become a best-seller. In September, a feature film based on the book, and carrying the same name, opened in Germany. And, several weeks ago, the movie's East Coast American premier took place at the American Film Institute in Silver Spring, Maryland, with Aust in attendance to answer questions from the sold-out audience. Der Baader-Meinhof Komplex begins with the anti-Vietnam and anti-Shah demonstrations in West Berlin of the late 1960s. Its depictions of left-wing leader Rudi Dutschke leading a chant of "Ho, Ho, Ho Chi Minh" at what is probably the Free University in Berlin, police violence against anti-Shah demonstrators, the shootings of Dutschke and student Benno Ohnesorg, and attacks on the right-wing Springer Press bring the viewer back to the maelstrom of violence out of which the Red Army Faction emerged. We see the evolution of Ulrike Meinhof from left-wing journalist to terrorist, as well as the emergence of Andreas Baader (a foul-mouthed thug with an appetite for violence) and his girlfriend Gudrun Ensslin, a minister's daughter-turned-radical. Director Uli Edel and writer Bernd Eichinger present the RAF as it was--a brutal, violent organization--while flatly and effectively contradicting some of the myths surrounding the group. They show the RAF shooting an unarmed office worker in a successful effort to free Baader from custody, placing bombs in police departments and at the Springer Press building, and exchanging fire with police after being offered the option of peacefully surrendering. They present the RAF seizure of the German Embassy in Stockholm and the murder of its military attache, Andreas von Mirbach. Scenes of the murder of German banker Jurgen Ponto in his home (though disputed in its details by his widow) and of the assassination of German Attorney General Siegfried Buback and his bodyguards with machine guns by two assassins on a motorcycle leave nothing to the imagination; they are barbaric. In 1972, Baader, Meinhof, and Ensslin were captured and placed in separate jails. But, in response to pressure from the prisoners and their supporters on the outside, they were moved to a special floor reserved for them in Stammheim prison. Many European intellectuals, including Jean-Paul Sartre, subsequently accepted the RAF's claim that the prisoners were being mistreated in Stammheim. One of the important accomplishments of Der Baader-Meinhof Komplex is to show that the prisoners resided in what was, as jails go, a relatively palatial environment. They had televisions, stereos, radios, and books. For the first time in post-war West German history, men and women were allowed on the same floor. They could meet and talk with one another in preparation for their trial. The film also depicts the role their lawyers played in conveying messages back and forth between RAF prisoners and RAF members on the outside--and in smuggling guns hidden inside legal briefing books to the prisoners. The high point of public attention for the group came in the fall of 1977 with the kidnapping of Hanns-Martin Schleyer, one of Germany's leading businessmen, in an effort to bargain for the release of the RAF prisoners. (Meinhof had committed suicide in 1976, but others were still alive.) The kidnapping began with a well-planned massacre. Schleyer's car was rammed by another. One of the RAF women pulled a machine gun out of a baby carriage. In seconds, other RAF members mowed down all of Schleyer's bodyguards and his driver with machine guns before seizing him. In a careful reconstruction of the crime scene based on the extensive investigation done at the time, Aust, Edel, and Eichinger have produced a cinematic moment that demolishes any of the romantic aura that may still surround these killers in some circles. In fact, police investigators found over 20 bullets in the corpses of two of the bodyguards. The film ends with Schleyer's murder in woods near the German-Belgium border. The film shatters one more RAF myth as well. When the West German government refused to release the prisoners, the RAF upped the ante and, with cooperation from Palestinian terrorists, seized a Lufthansa flight and threatened to blow it up unless its demands were met. After German special forces stormed the plane and released the hostages, the RAF prisoners in Stammheim committed suicide. The RAF and its gullible or cynical apologists insisted that they were murdered. Investigations by numerous judicial and parliamentary bodies have repeatedly confirmed that two of the prisoners shot themselves with guns smuggled into the prison, while another hanged herself. A fourth attempted suicide by stabbing herself but was saved by prison doctors. Der Baader-Meinhof Komplex places on the big screen the truth about these self-inflicted deaths, which RAF supporters transformed into a politically useful story of martyrdom at the hands of the allegedly fascist state. The movie isn't perfect, of course. The biggest failing is that it glosses over the ideological context of the RAF story: the history of anti-semitism and communism in Germany, and how these ugly currents gave rise to a group of politically motivated murderers. True, the movie acknowledges the RAF's connections with Palestinian terror organizations in both Jordan and Iraq, two countries where its members sought refuge from German authorities. But, unfortunately, it does not have Ulrike Meinhof's character recite the anti-Zionist and anti-Semitic diatribe she wrote justifying what she called the Munich "aktion"--the 1972 murder of Israel's Olympic wrestling team. Nor does it make clear that RAF members saw themselves as part of the Marxist-Leninist tradition. In a manifesto from 1971, "On the Armed Struggle in Western Europe," RAF authors wrote that "Lenin had especially advocated the first goal of armed struggle, that is, the liquidation of individual functionaries of the apparatus of oppression." It was no surprise, then, that the East German government granted refuge to RAF members. In its theory and practice, the RAF was a chapter in the history of communism in twentieth century Europe. Of course, I realize it might have been difficult to cram these points about political ideology into what is, first and foremost, a work of entertainment. The bottom line is that, despite its shortcomings, the film presents the essential--the murders of the 1970s--and shows RAF members as the killers they were. This is cause enough for historians to celebrate. The admirable candor of Der Baader-Meinhof Komplex provides a much-needed challenge to Hollywood. No major American movie has yet told the story of the Weathermen, or for that matter the Black Panthers, with equal honesty. To be sure, the Weathermen did not engage in a campaign of murder comparable to that of the Red Army Faction in West Germany--or the Red Brigades in Italy or the Japanese Red Army. But neither, as some seem to think, was it simply the angriest part of the anti-war movement. In fact, its stated purpose was to carry out "armed struggle" in the United States in solidarity with third world communist movements and with the Black Panther Party in this country. The bombs being prepared by Weathermen in a Manhattan townhouse that exploded in March 1970 were intended to be set off at an upcoming dance for soldiers and their dates at Fort Dix. Had they exploded at the dance, dozens, perhaps hundreds, of people would have been killed. Members of the Weathermen were fond of arrogantly denouncing the great majority of participants in the anti-war and civil rights movements who declined to "pick up the gun." They mocked this decency as evidence of a "non-struggle attitude" or as the result of "white skin privilege." Today, former Weathermen leader Bill Ayers continues to rationalize the actions taken by his group--most prominently in a recent New York Times op-ed piece. An American equivalent of Der Baader-Meinhof Komplex--a movie that aimed to set the historical record straight by portraying the most violent 1960s radicals as they truly were--would do an enormous service. 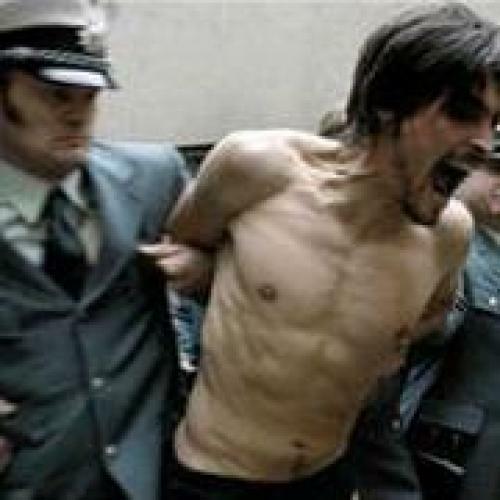 The German film industry has nominated Der Baader-Meinhof Komplex for the Academy Award for best foreign film. I hope that it receives that honor and the additional exposure that would come with it. But, whether or not it wins an Oscar, I hope that American filmmakers take this movie as a long overdue invitation to revisit the uglier side of this country's experience with radicalism during the 1960s--and engage in some Vergangenheitsbewältigung of our own. Jeffrey Herf teaches European history at the University of Maryland, College Park. He is the author of Divided Memory: The Nazi Past in the Two Germanys and The Jewish Enemy: Nazi Propaganda During World War II and the Holocaust.